Lille is in the northern part of France, right near the border of Belgium. Note that XDB is a train station. 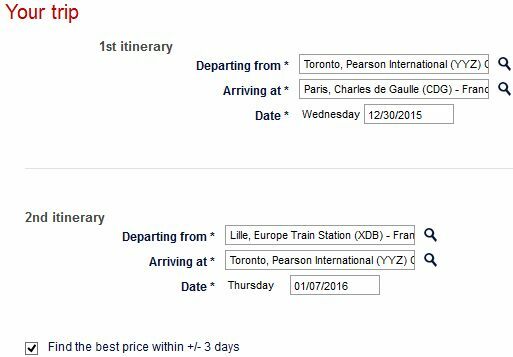 So on the way home, your airfare includes a train ticket from XDB back to Paris to catch the flight to Toronto. To book, you can go to www.airfrance.ca and click on 'Multi-destination itinerary'. Search for a flight from YYZ to CDG, and then XDB to YYZ. Try Wed & Thu dates from October 2015 through to early January 2016. One interesting date combo is December 30 to January 7. New Year's in Paris! "To get from Paris to Lille you can take a Flibco bus or a Megabus. I think megabus actually stops at the airport a few times a day. Busses would take about three hours, so they are slower but also cheaper than the trains (Thalys and another option, I forget). In general it's 20-40 euros one way. Definitely buy ahead as the busses sell out and train tickets can get super pricy the day of. Alternatively, if you're up for an adventure, you can sign up for a cheap ride share with locals on blablacar." Yes, with this multi-city deal you can spend time in each city. You can also substitute Amsterdam for Paris, and it will work out to about $20 more. With the example links above, the dates are in November. You can try adjusting the dates to other dates between September 2015 and February 2016. You may want to focus on Tuesday flights at first, to see if the cheap price is available. KLM.com - click on 'several destinations' on the home page to start your search. AirFrance.ca - click on 'Multi-destination itinerary' on the home page to start your search. Search for Sunday, Tuesday, or Friday flights in September/October 2015 and May/June 2016. NOTE: Third party booking website FareDepot is claiming that some of these can be booked for even less. Such as Toronto to Tallinn, Estonia $442 CAD roundtrip including taxes. Or Toronto - Copenhagen for $524. Be forewarned that FareDepot is ranked #18 in the third party website power rankings. You can also fly into one city, and out of another, for similar prices. Start at the Finnair.com home page, and click on 'Multiple destination'. ...which currently comes up as $559 CAD including taxes for both flights. It looks like Toronto - Sofia, Bulgaria (SOF) can now be had for $599 CAD roundtrip including taxes on certain dates in October (second half), November, and December 2015 (first half). The flights are with Air France / KLM & Bulgaria Air. Where to stay in Paris, Lille, Amsterdam, Helsinki, etc? The following AirBNB links will lead you to some great deals on places to stay for under $80 CAD per night for 2 guests. Special thanks to Sohaib and Rishi 'The One' Modi for being the first to find and post deals #2 and #3 respectively. toronto, yyz, flight deals, europe, northern europe, western europe, netherlands, american airlines, central europe, paris, france, cdg, nordic countries, amsterdam, ams, eastern europe, copenhagen, denmark, cph, scandinavia, oslo, norway, osl, stockholm, sweden, arn, klm, air france, helsinki, hel, british airways, finland, finnair, tallinn, estonia, tll, baltic states, riga, latvia, rix, lille, xdb, vilnius, lithuania, vno, sofia, bulgaria, sof and air bulgaria. 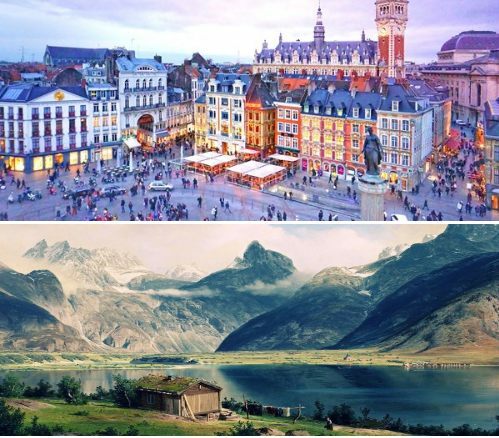 24 Responses to "Toronto to Paris, Amsterdam, Finland, & other Scandinavian countries | in the $500s roundtrip including taxes"
Would you have to start the return trip in Lille? Or could you just show up at CDG and check in there? ...it does look like you need to complete the train leg to validate the air ticket. Airlines don't like it when you miss a leg of a journey, and apparently that goes for flights involving trains as well ! any idea about cancellation policy on air france ticket? what about the KLM fight in October frm yyz to Helsinki to ams to yyz, id I want to cancel it later I cant? My wife and I just booked the Toronto - Pairs - Lille - Toronto flight. We thought that Paris may be a couple of years away but at this price we couldn't say no. 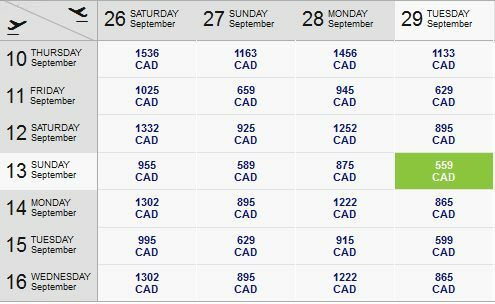 Ended up booking through Flighthub at $535 each Oct 8 - 20. Thanks again for everything you do. You make travelling affordable. How are you all finding it?? JI, finding what? You might need to be more specific. Follow the instructions in the post, and experiment with a variety of dates. Thanks Dave! Have a great time in Paris! The link for Air France is not working. Is it working for you guys now? Thanks Sadaf. I've fixed the link, but it may take a little while before it works, due to caching. In the mean time, you can just go to www.airfrance.ca directly. hi there. 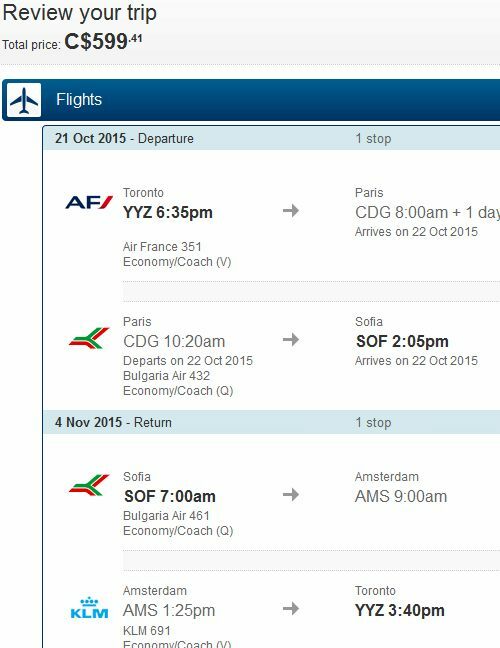 for the paris-lille-toronto trip, do we buy our own train ticket from paris to lille? i understand that the ticket is already included from lille back to paris. thanks. Thx for deal #3 Rishi 'The One' Modi! Nothing like a sale to narrow down your vacation choices... or even to strongarm you into taking a vacation period! Anyone try building a multi-city with this. Hoping to do 2 night Copenhagen, 2 nights Oslo and 2 nights Stockholm but would need to do flights or options between cities as well. Rach: Yes, you would need to find your own way from Paris to Lille. "To get from Paris to Lille you can take a Flibco bus or a Megabus. I think megabus actually stops at the airport a few times a day. Busses would take about three hours, so they are slower but also cheaper than the trains (Thalys and another option, I forget). In general it's 20-40 euros one way. Definitely buy ahead as the busses sell out and train tickets can get super pricy the day of. Alternatively, if you're up for an adventure, you can sign up for a cheap ride share with locals on blablacar"
For the Paris/Lille ticket has anyone checked with Air France on needing to complete the train for the cheaper fare? Fly in to Paris; spend 4 nights there. Take the train to Lille; spend one day and one night there and then take the train from Lille back to Paris and fly to Toronto. The return leg is fine, my concern is if I don't take the train on first leg and simply get off in Paris; will my return ticket become invalidated? Does anyone know if you have to have your checked bags with you for the train leg from Lille to Paris? I was going to book a one way train ticket to Lille just to do the check in...but I'd rather not drag my bags with me as I'm not checking out of my Paris hotel until the next day. Thanks! How did you guys get the following: Copehagen, Denmark CPH $585? 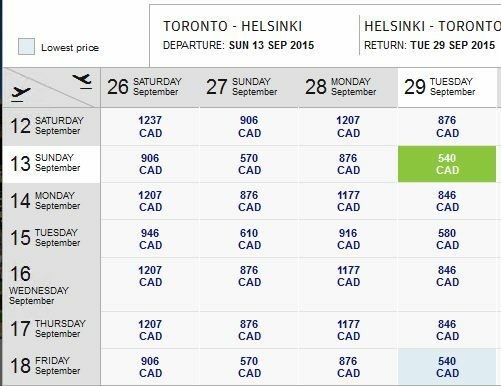 I tried Finnair/BA/AA and can't get below ~900CAD for roundtrip YYZ-CPH. Thanks. Thinking of booking the one to Amsterdam but skipping Helsinki. The flight has a layover in Amsterdam then goes to Helsinki and then flight # 2 goes from there to Amsterdam. What would happen if I just got off at Amsterdam in the first place? Will I have trouble getting my luggage? or will there be an issues coming back to Toronto from the airline? Just looking for advice from someone who's done something similar before? I am trying to do Toronto-Amsterdam-Helinski-Toronto. I plan to stay maximum 15-18 days. Helinski for max 2 days the rest in Amsterdam. Also looking for september. Is this deal still available? I am trying to get the deal for Toronto to Oslo for $552 but can't figure out how. It could be gone, this alert was sent out nearly 3 weeks ago! Wondering same as Sarah, just wanna stay in Amsterdam and skip Helsinki route...is that possible?